While some Minnesota Forest Legacy Partners were in Ontario on the Canadian leg of the Seeing the Trees AND the Forest productivity tour, others gathered Thursday night at the Nicollet Island Pavilion in Minneapolis for the 15th annual Minnesota Environmental Initiative Award Ceremony. 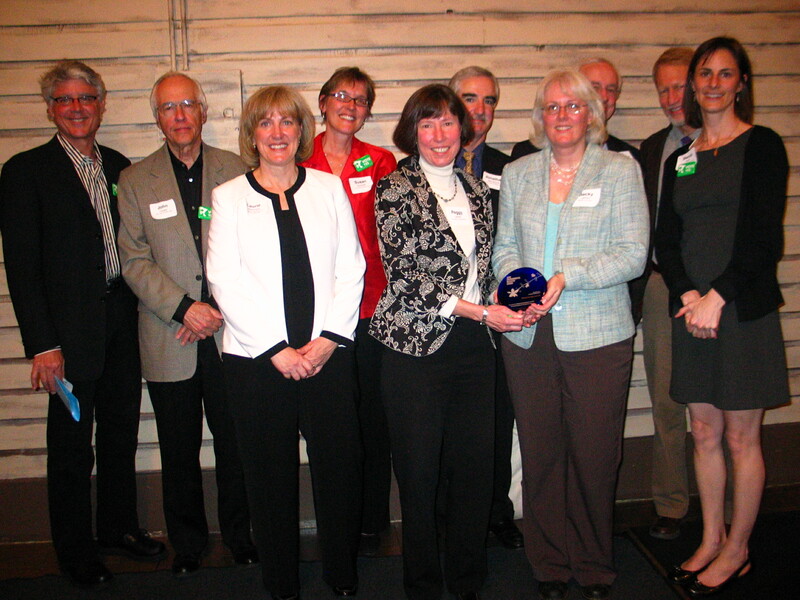 The Partnership won the Natural Resource Protection and Restoration award. Peggy Ladner of The Nature Conservancy accepted the award on behalf of the Partnership. A complete listing of nominees and winners is avaiable at MEI’s website. Click here to listen to Blandin Foundation president and CEO Jim Hoolihan post-event podcast and learn more about the Minnesota Forest Legacy Partnership. Undersecretary for Natural Resources and Environment Mark Rey was in Minnesota today to announce along with DNR Commissioner Mark Holsten that the Koochiching Forest Legacy Project will receive nearly $3.5 million in federal dollars. This Phase II funding will be used towards adding roughly 38,000 acres to the initial 51,000 Forest Capital Partners easement closed in October 2007. A third phase is planned for 2009, bringing total acres of the Koochiching Forest Legacy Project to just under 128,000 acres – that’s close to 200 square miles! Federal officials this morning will celebrate their installment of a public-private conservation effort to protect part of Minnesot’s north woods from development. Top U.S. Forest Service officials will be in St. Paul to herald a $3.5 million appropriation to buy conservation easements on undeveloped, privately-owned forest land in southern Koochiching and northern Itasca Counties. It’s the second of three phases of the Koochiching Forest Legacy Program backed by state and federal agencies and private conservation groups in an effort to keep large tracts of contiguous forest from being sold, divided and developed. The program has been praised for preserving the environmental benefits of undeveloped land, providing trees for local loggers and keeping land open to the public for hunting and hiking. In December the News Tribune reported that the $3.5 million was included in Congress omnibus spending bill. Last year the state sealed a deal to buy conservation easements on 51,163 acres in the area. This year’s federal aid will add another 38,331 acres. The third phase is set for 2009 and will add another 38,300 acres. When completed, some 127,794 acres ” nearly 200 square miles ” will be included in the project. Much of the land is in and near the Koochiching and George Washington state forests. It’s the largest such forest land conservation effort state history. The forest parcels once were owned by Boise Cascade Corp. and were managed for decades as wild land to provide trees for the company’s mills. It now is owned by Forest Capital Partners which makes money by holding and selling land as a real estate investment to be developed. Under the forest legacy program, Forest Capital Partners will be paid for the conservation easements. The company will continue to own the land and pay property taxes, but the state will hold the legally binding easements that prevent the land from being sold or developed. The company will continue to manage the land for forestry and sell trees to be cut by loggers, providing continued wood for the region’s mills. In addition, the land will remain open to public access like deer hunting, berry picking and hiking. While northern Minnesota has large tracts of federal, state and county-managed public lands, half of the state’s forests are privately owned. That land is rapidly rising in value and is being sold for recreation and retirement homes at a breakneck pace. Keeping large tracts of private forest undeveloped is considered a critical issue for many of the region’s wildlife, including birds, which tend to leave areas where new roads, homes and cabins are built. The private parcels in the program often help form connections or corridors to large public tracts. In addition to the U.S. Forest Service and Minnesota Department of Natural Resources, the Blandin Foundation, Conservation Fund and Trust for Public Land are involved in the effort with Forest Capital Partners. Similar efforts to use conservation easements to keep forested private land undeveloped have been struck in Lake County, southern Itasca County near Grand Rapids and in Crow Wing County near Brainerd.